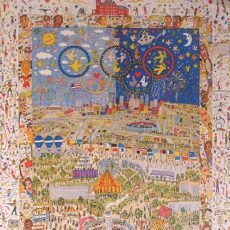 James Rizzi started using 3D in his artwork by creating an etching and printing it twice, hand coloring it, and then cutting parts out that he would then materials to raise them up and give them depth. 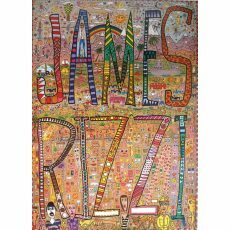 James Rizzi studied Fine Arts at the University of Florida in Gainesville, Florida. 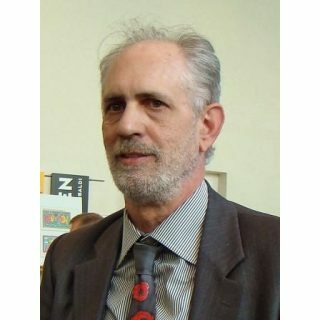 He came up with the idea of 3D multiples now mostly associated with his name when, having taken classes in painting, printmaking and sculpturing, he had to hand in grade work for all three subjects, but only had time for doing one. Most of his work consistered of large elaborate prints and teeming anthropomophic cityscapes. This new and exciting style of artwork became a brand of sorts for him as an artist. These whimsical pieces may give off the appearance of the work of a child at first but when you closely examine the pieces you can see that they are extremely detailed and executed properly.